leadership team quartet at the company. Kornit Digital Europe - Leadership team from left - Wilfried Kampe, Oliver Luedtke, Monika Morck and Nikolaus NowakKornit Digital Europe has announced that Nikolaus Nowak has been appointed Customer Service and Logistics Manager in a move which completes the quartet that now makes up the experienced leadership team at the company’s Düsseldorf head-quarters. Nowak, who has more than two decades of experience in a similar role, now joins this digital textile printer manufacturer following six years with Heidelberg’s Mexican subsidiary where he was responsible for more than 100 field engineers. He joins Managing Director, Wilfried Kampe, and Oliver Luedtke who is European Marketing Manager of Kornit Digital Europe. The fourth member of the leadership team is Monika Morck, Head of Accounting, who has been in the role for the past twelve months. 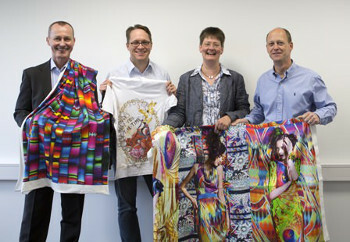 Kornit Digital Europe was established in 2010 to support the growing demand for the company’s direct-to-textile printers including its move into the industrial market with the Kornit Allegro roll-fed machine. Over the past three years, Kornit Digital Europe said it has developed into a fully-grown service, sales, marketing and logistics hub for the European market, inline with support for further expansion. As a result, added the company, it is now closer to the specific demands of the region, with the ability to generate faster response times and simplify logistics and distribution for resellers.